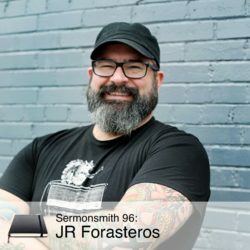 JR Forasteros is an author, pastor and podcaster in Dallas, TX. He serves as Catalyst Church’s teaching pastor and wants to be the Unbeatable Squirrel Girl when he grows up. His wife Amanda skates as Mother Terrorista for Assassination City Roller Derby. His book, /Empathy for the Devil/, is available from InterVarsity Press, and you can find his writing at Think Christian and Relevant magazine. He co-hosts the StoryMen (authors you should be reading), In All Things Charity (Wesleyan Feminist Theology) and Don’t Split Up! (horror film review) podcasts. His weekly faith & pop culture newsletter is available at stuffyoullprobablylike.com.